Window coverings take on a plethora of shapes, sizes and designs. It’s a matter of taste and functionality. 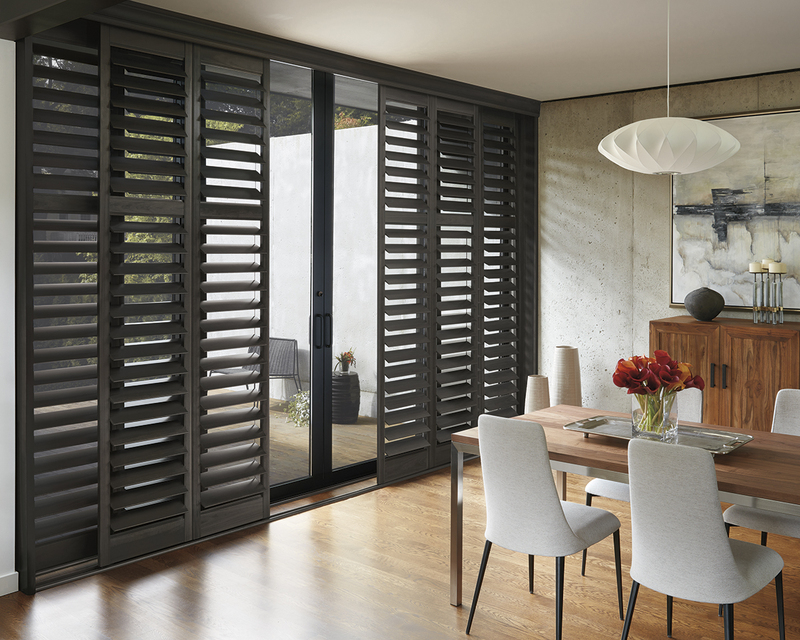 Some choose blinds or drapery and others go beyond with shutters. There’s a certain facial expression that many people make when they enter a home and notice windows covered with attractive, well made shutters. Often times the thought accompanying the perception is ‘wow, they must be doing pretty well, shutters aren’t cheap!’ Even though today’s window fashions widely span the spectrum of design and price, shutters always evoke a chic perception of wealth. They add value to a home and can amp up the curb appeal of a house. Clean lines offer a crisp visual, and wood gives an air of richness and prestige, especially as window covering. Whether you select to go with classic wood shutters or the popular California design, our installation will be impeccable, we guarantee it. You will welcome into your home or cottage perfectly fit solid excellence in flexibility of look and light variance. We even have ample experience installing shutters on very large sizes and unique shapes of windows and sliding glass doors to complete continuity of design throughout the interior décor. Take a look at what we have to offer here, or better yet visit our showroom, or even better than that… we’ll come out to you! Tell us what you dream to see and we’ll best present you with all of your design and price options in shutters and blinds, and curtains for that matter, because we do it all. Window fashion is not limited to materials. Many people select shutters for the statement they make and the flexibility they offer. All closed up and your shutters could turn day into night. Dull overcast days could still fill a room with soothing light when your shutters are angled just right. Privacy, visual appeal and control of light make these window coverings a joy to own. Fully closed California shutters done in white or very light colours even give off a feeling of brightness when there is minimal to no lighting available at all. This is especially nice during cold, stormy winter days. Fully closed shutters can also act as a cold shield to aid in trapping any chilly air emanating from the windows. In addition, they make for a good return on investment when it comes time to sell your home or cottage. When the time comes to put your place up on the market for sale, potential buyers will most likely be quite impressed to see shutters covering the windows as they approach the property. They add value to a house and are often pointed out by Real Estate agents as an added pleasing feature. The look is rich and clean, especially if purchased from Cadillac Window Fashions. It’s hard to resist the eye candy that classic California or wood shutters provide. Open or closed, light or dark, shutters are at a level all their own apart from all other window coverings. They whisper wealth and class, both inside and out. If you’re considering inviting shutters into your home, contact us first to conveniently have one of our experienced designers visit your home to plan some awesomeness with a free consultation. We provide beautiful window covering solutions in many homes and businesses in Toronto, Vaughan, Mississauga, Scarborough, the GTA and more. Visit us here to discover more Cadillac Window Fashions.